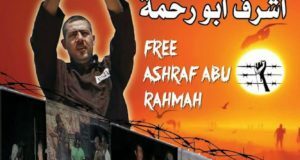 Home / Reports / Bil’in Demos Endure – Even During the World Cup! Bil’in Demos Endure – Even During the World Cup! 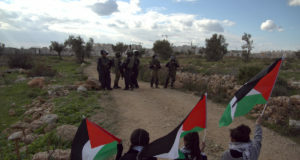 Today Palestinians from the village of Bil’in had another demonstration against the apartheid wall. 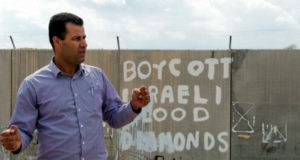 They were joined by internationals from several different countries as well as Israeli activists. There is a small outpost on the outside of the village on the other side of the annexation barrier. This is within view of the Israeli settlement there. Different people are posted daily to keep watch. Two activists–one from Sweden and one from the UK–staying here for several days, were present during the World Cup when their countries played against each other. TV Arabia came to interview them in this interesting circumstance, that they should be here, struggling together against this illegal occupation, watching this game with other Palestinians while their friends were possibly in the stands or at home enjoying the same match. From this, an idea for today’s action was born. Several people came dressed in various team jerseys representing different countries, and a giant soccer ball was created for use in a mock match. 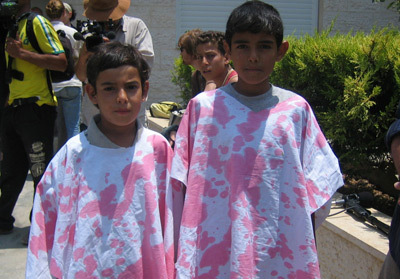 In addition, several activists wore white t-shirts stained with red paint to represent the continuous massacre of Palestinians while the world enjoys the football games in Germany. We arrived at the fence, where soldiers greeted us with jeeps, guns and shields. 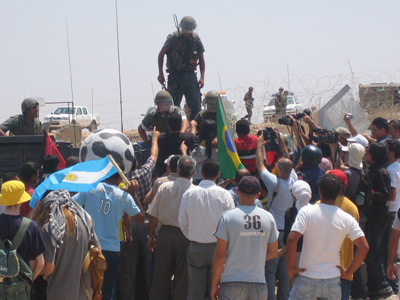 There were several people who threw the large soccer ball around, and things were relatively quiet until a local man was seized by the soldiers and pulled over the gate where he was carried away by more than 5 soldiers. He was later released. The soldiers crossed the gate and tried to push us back. People lay in the white ‘blood’ stained t-shirts blocking the jeeps passage until they started to toss sound bombs into the crowd. Afterward activists linked arms and sat down in front of the jeeps passage. The soldiers didn’t advance further. Children tossed rocks at the soldiers, and they released tear gas upon the group as we walked. Afterward we debriefed the day’s actions together before parting.